Should Swim Practices be Open or Closed to Spectators? I was following an online forum discussion among swim coaches about whether practices should be open or closed, and I was surprised at the diversity of opinion. It reminded me that coaching is not just about training swimmers, but requires a lot of interpersonal skills supplemented with education and experience. I was a little surprised at how many coaches want to have completely closed workouts. Closed as in, no spectators allowed on deck or in the stands. These coaches explain this by saying that the presence of parents, friends, etc can be a major distraction to the swimmers, and will inevitably provide interruptions to the flow of the workout. This can certainly be true. Many parents of younger swimmers love to be there vocally for the kids, some with ill-advised stroke tips, others to wave and expect a wave back. There are other parents who will demand face time with a coach during practice when there is a perceived problem, unfairness, or slight. As a swimmer, distractions can come from the strangest places. I still remember being a relatively young swimmer training with the older, high school boys. When a girl friend of one of these boys came to watch a practice I was given strict instructions to not pass the older boys. Stay slower than them. I have to wonder though whether close-practice proponents are talking about younger swimmers or older swimmers. Younger swimmers are usually easily distracted, and parents are more likely to interrupt things. But on the other side, parents of young swimmers should absolutely be there to observe the environment and demeanour of their coach, and to determine if they want this coach in charge of their swimmer. Older swimmers are usually more focussed, with parents who are usually a little more hands-off. However, even with older swimmers, parents should ensure that this is the environment they want. The biggest surprise for me was that some coaches seem to be completely ok with parents and spectators not only at practice, but even on deck. One coach explained it as saying that he had a meeting with all parents at the start of the season and explained their role. This was apparently enough to maintain smooth practices for the year. All I can say is that I’m incredibly impressed. I cannot imagine having parents right on deck and still maintaining discipline. And especially not for the whole year. Most of the time, if a parent feels the need to interrupt or distract, instructions from a meeting won’t stop them. Those in favour of open practices did point out that discussions between parents and coaches should only take place before or after practice, and when the coach is ready to talk. We can’t be talking to a parent and still coach the swimmers. Over the course of my swimming and coaching careers I’ve been exposed to many variations of open and closed practices. So it shouldn’t be surprising when faced with such polar opposites that I prefer something in between. For our team, we don’t allow parents on deck, but do allow them (and encourage them) to be in the stands watching. We ask parents not to talk to us during practices except in emergencies. Of course, the definition of emergency is pretty vague, so we still get interruptions, but it’s working quite well in general. I like this policy, as it allows for relatively disturbance-free practices, and allows for the establishment of trust with parents. We also have a policy where the coach will never be required to be alone with a swimmer at any time. This is why we discourage coaches driving swimmers unless in emergencies, and never just one swimmer in a car. This is to further that necessary trust component. The best comment I read was the idea that the coach should include certain practices where parents could be involved, such as counting lengths in the swim-a-thon, or recording times, heart rate, perceived exertion, etc for certain sets. Where do you stand as parents? Coaches? Swimmers? Do you like open or closed practices? 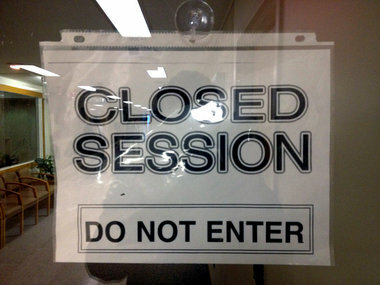 Wow so weird….didnt know there was such thing as closed practices. How would you be sure your child was in the right hands?! I like the middle route that we have, but this has been an interesting read! From a parent’s point of view, open sessions are about more than just watching the swimming. This is where new members of the swimming club committee can be found, where arrangements for meets are made, car sharing, club shop, fund-raisers and socials are organised. Swim sessions can be long and to be at the right level for the swimmer, may be a distance from home. Parents are paying for this, would it be right to make them wait outside in the cold? I love your comment, Polly. You’re absolutely right in that the stands is where we end up recruiting willing parents to help out with team functions. And by doing this, we foster the concept of a team spirit and community.